Invented by Taiwan’s EVA Air in 1992, and then taken up most enthusiastically by Virgin Atlantic, Premium Economy is now offered by many airlines as a way of generating extra revenue and giving passengers, prepared to pay, something more exclusive than what is termed Economy, and sometimes as ‘Coach’. Usually this includes extra legroom, passengers in and out of the UK paying double the tax (APD) to those in the ‘back end’, the same charge as in First Class. The standards (and prices) vary considerably from, at the top end Air New Zealand, virtually Business Class without the flat bed seat, to certain US carriers, where what you get is extremely limited, a little more legroom and free spirits on transatlantic flights, but only for a small fee (plus tax). Writer and regular traveller Rupert Parker has been sampling KLM’s latest offering. It’s a lengthy flight to Panama City taking around 11 hours, a long time if you’re stuck in Economy, on any airline, no matter what they say. From the UK if you want to avoid changing in the USA, then you’ve got two choices, Iberia from Madrid, or KLM from Amsterdam. Now I’d had a dreadful experience flying to Costa Rica with Iberia where their entertainment system is still just a drop down screen from the cabin roof so I looked at KLM. They offer what they call “Economy Comfort” for between €60-160 extra, depending on the flight. They claim you get up to 10cm (4 inch) more legroom, double the recline and seats at the front of the Economy class cabin. It seemed like a bargain. Since the flight from Schiphol was scheduled to be early morning, I took one of their Cityhopper services from Heathrow, the night before. I’d done this a few weeks previous and can heartily recommend the Citizen M Hotel which is 10 minute’s walk from the terminal and offers good value at around €80. The other smart move is to choose your seat, as early as you can, and KLM offers check-in starting 30 hours before departure. I struck gold with a bulkhead seat, right at the front of the cabin, where there are only two seats on the right and left hand sides. 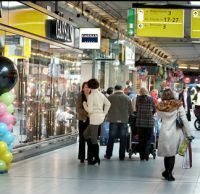 I like Schiphol and the London airports could learn a thing from them. There are proper shops, even a small supermarket in their concourse, and, best of all, you don’t have to go through baggage security until you get to your gate. This means you’re only queuing behind the people travelling to your destination, rather than novice travellers on their way to the Indian sub-continent who don’t know the rules about liquids, coats, belts, shoes etc. It’s also useful as the people who are manning the scanners are aware of the departure time of your flight, so they’ll do their upmost to get you through if you’re late. So to the flight. The plane was a Boeing 777-200 with 249 in Economy, 34 in Economy Comfort and 35 in Business. You don’t get any extra baggage allowance or advance boarding options with Economy Comfort and you have to wait your turn with the rest. Fortunately I found myself with an empty seat next to me, and the extra legroom, coupled with being up against the bulkhead really made a difference. It also meant I was the first to get the drinks and meals service and avoided the dreaded “your meal choice has run out” problem. Food was also economy food but, KLM are generous and you do get two full meals. There was a wide choice of movies, although there was no touch screen and the handset controller was one of those that should have been consigned to a museum a long time ago. I must say I arrived in Panama City feeling fairly pretty good, and the service was excellent throughout. My return was a different matter. I’d been stuck on a desert island, with no internet access, so I arrived at the airport not having booked my seat. I was horrified to find myself stuck in the middle aisle with people either side of me. The flight was full so there was no possibility of moving, but I must say the extra legroom did make a difference. Would I use it again? Yes I think it’s good value and, providing you’re quick off the mark choosing your seat, then it’s definitely a cut above Economy. Best seats are right at the front, or the aisle seats in the second row, as you have nobody in front of you.